Fielder’s Choice is the third book in the Tavonesi series and is one of my favorites. Telling the story of Matt and Alana, with a lovely dose of Matt’s precocious daughter Sophie. Alana, born into the Tavonesi family, has always been a jet-setter and has come back to California to take over the olive oil faction of the business. When she and Matt meet each other, the attraction is instantaneous, but the relationship is a slow burn. Both of them have reasons to be wary – Alana’s childhood didn’t teach her to trust and Matt has Sophie to worry about. However, after Sophie goes missing during a summer camp activity, the two are forced to confront their attraction and they find their happily ever after. 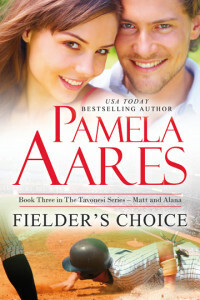 Fielder’s Choice is a great book and the relationship is sweet and well written. I truly enjoyed this one, and I feel other readers will too. As I’ve said elsewhere, baseball and beer go hand and hand for me, so that’s the beverage recommendation for this whole series. Check out Craft Beer to find the best available in your area. Until this book, I thought all olive oil was made in Italy, so it was fun to read about the California industry. If summer camp for your kiddos sounds like a fabulous idea, make sure to check out Triple R in Virginia. Baseball, Beer, Books with Children, Contemporary, Romance, Series, U.S.